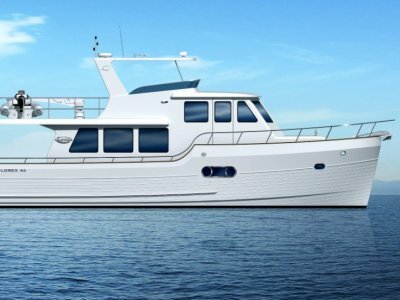 A unique opportunity exists to purchase this beautiful 2012 model Cordova 48. The vessel has been cared for by Cummins from new and the final service under this package is due in August this year. This vessel can only be described as superb and was delivered new in August 2012 with her owners now preparing for a larger vessel. 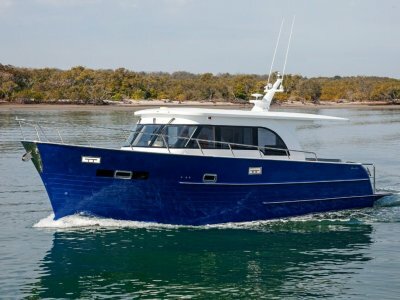 With a custom build layout, immaculate attention to detail and additional back up systems, "ESCAPE" is the most optioned Cordova we have ever built and is unique in her styling and colour palette. She is powered by twin Cummins QSB 440 HP diesels. A two cabin and two bathroom boat, this 48 is also equipped with a hydraulic swim platform for ease of tender launching and a great feature for all the family. The electronics suite is comprehensive with twin Raymarine E 125 touch screen displays with radar, GPS and plotter systems at both helms, auto pilot and VHF at upper and lower stations, chain counters, twin Smartcraft engine monitoring gauges at each helm and the most comprehensive Fusion DVD and ipod system throughout the saloon, cockpit and flybridge and even includes a KVH satellite TV dome. Internally this 48 has an extremely open and contemporary design and features twin Franke recessed sinks with strainers and teak insert cutting boards along with Smeg cooktop and Smeg combination convection oven, grill and microwave. Air conditioning throughout the saloon and cabins along with an upgraded 13.5 kva genset and 2000 watt inverter for excellent power control at anchor. Two 40 inch LED TV's can be used in the saloon or on the flybridge area which is upgraded with a rear euro awning for shade to the rear rail, Sunbrella upholstery, bbq, sink and combo icemaker and fridge, of course she has a hardtop and clears to three sides with a rear Sunbrella enclosure across the rear of the bridge complimented by a stainless steel aft awning mounted to the hardtop. Even the engine room has been customised with teak grating between the engine beds, giving "ESCAPE" a complete custom finish. 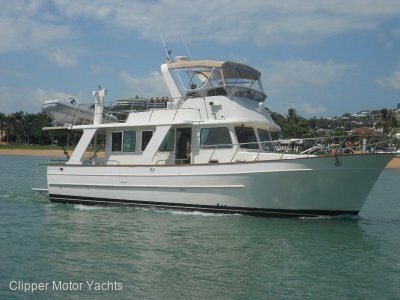 Be quick to secure this gorgeous, great value motor yacht. For a full inventory and to arrange inspection, please contact us. 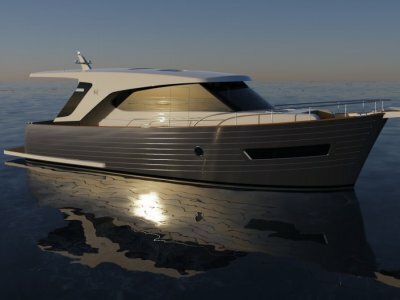 Disclaimer: Pacific Motor Yachts offers the details of this vessel in good faith but cannot GUARANTEE nor WARRANT the accuracy of this information. The condition of the vessel, inventory, inclusions is subject to change or deletion without notice prior to sale. We highly recommend that every potential purchase inspects or arranges a marine surveyor and mechanic to determine the suitability for the vessels intended use. 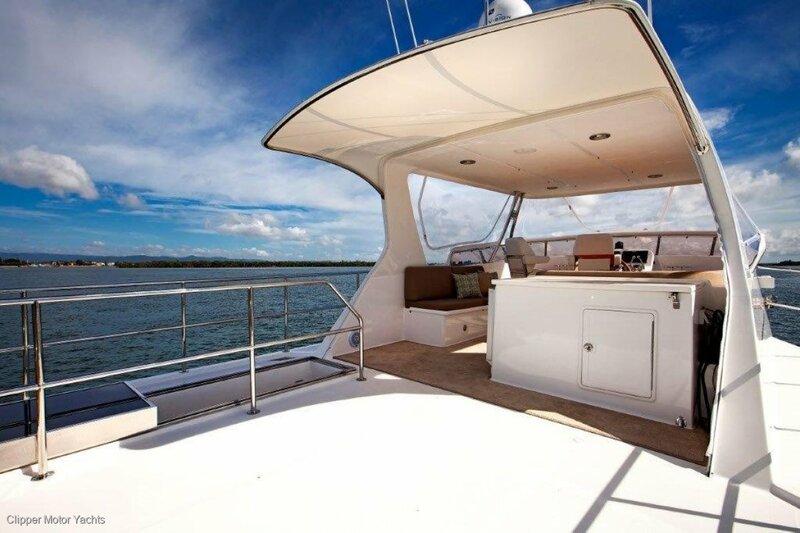 Pacific Motor yachts can also offer quotes for Insurance, Transport and Finance. Fibreglass with teak laid to, cockpit, swim platform and side decks.